If you think that the words “custom” and “modular” do not belong together, you haven’t seen custom modular homes built by F&N Homes in Bloomsburg, PA.
Why would modular home projects have doubled in the past 10 years? For the same reasons you would not hire a bunch of mechanics to build a car in your driveway, you don’t want to hire a bunch of contractors and subcontractors to assemble what will be your home, from stick to finished product, exposed to weather and security risks on your building site. The idealistic notion that a stick-built home is superior or more unique than a modular home does not hold up under the realities of current modular construction practices. The modular homes first made popular in the 1970s are not today’s modulars. Modular homes are not mobile homes or doublewides. They are not inferior in construction. They are not one-size-fits-all in design and materials. You cannot tell the difference between a modular and a stick-built home when you look at it. But you will be able to tell the difference in some other very important ways when you live in it. The main reason you should choose a modular home is not lower cost or faster construction time, though those are both also advantages. You should choose a modular home because it is superior in quality. Modular homes are constructed, in units, in a climate-controlled factory with no exposure to weather. Because modular manufacturers produce large numbers of components, they can purchase premium materials at reduced rates. As with any assembly-line production, the workforce is highly trained and specialized to produce specific elements under close supervision. Because modular units will be transported to the building site, they are manufactured to be stronger and more durable. Modular manufacturing facilities use large, powerful equipment with superior precision jigs and assembly. This precision manufacturing and assembly produces components that fit together perfectly to provide extraordinary energy efficiency and structural integrity. Most modular homes can be built in as little as 8 weeks compared to 4 to 6 months for a stick-built home. Your modular home built in the factory is not subject to weather delays encountered when building a house on site. Your excavation and foundation preparation can be completed at the same time your modular components are being manufactured in the factory, so no waiting for one phase to be completed before the next begins….and don’t forget weather delays for stick-built! Because you know what your components will look like and how they will work together, you will not have delays for redesigning and rebidding parts of the projects. You also reduce the risk of vandalism or theft of building materials with decreased exposure time from delivery of components to secure structure. You will decrease the time you have to wait until you can move into your new home, and you will reduce the stress and time you devote to overseeing the construction process from start to finish. If you save time, you save money. You know from the time you select your components exactly what you will be getting and what you will be paying – no allowances for floors or cabinets or countertops that expand with upgrades as you go. All your planning is done before the construction begins, so no change orders that can drive costs up. Modular manufacturers can guarantee their prices for longer periods of time because they can purchase materials well in advance and avoid drastic fluctuations in prices due to economic factors or weather-related demands for building materials. Using an assembly-line process allows modular manufacturers to hire a highly-trained, specialized workforce to work efficiently at wages well below individual plumbers, electricians or carpenters. And you will reap the cost savings of energy efficiency in your modular home for years after the construction is complete. You have a better chance of selecting and arranging various components to create a custom look and feel for your modular home than you would with many contractors developing MacHomes in subdivisions. Nearly every element in your modular home can be customized to suit your needs and tastes. Even if you choose a stick-built option, many of the parts of your home – pre-hung windows and doors, manufactured cabinets, roof trusses and indoor molding – will be produced as modular components before they reach your site, but you will not realize the overall advantages of a fully modular home. The idea of modular homes as cheaply constructed, identical boxes is as old as those earth shoes from the 1970s. 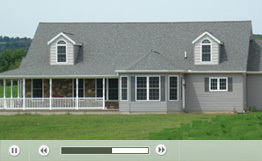 Modular homes are cost-effective, timesaving, energy-conserving, safe, and yes, customizable. Contact F&N Homes to see our custom modular homes and set up an appointment to meet with one of our builders to put you in the home that is right just for you.